The Braves' Aspen Slifka scores 23 points and grabs nine rebounds in a key Cowapa win over the Fishermen. 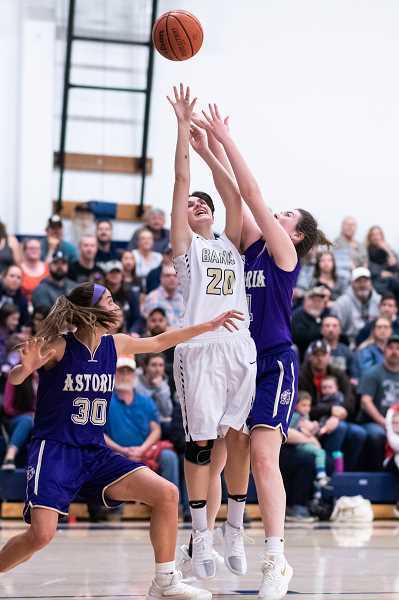 Banks did what Banks does Friday night against Astoria, riding the backs of standout seniors Aspen Slifka and Gracie Nelson to a big Cowapa League win over the Fishermen, 51-32. But while the two Braves standouts did their part, it was the work of their young supporting cast that had head coach Brandon Begley all smiles after the game, Jan. 18, at Banks High School. "The girls are starting to mesh and the younger girls are no longer standing back," Begley said. "They're starting to make an impact which is huge, especially on the defensive end, and that's what we need from them." While Slifka and Nelson did the heavy lifting, Banks got tangential, yet key contributions from sophomore Maddy Shook, and freshmen Nya Johnson and Maggie Streblow who combined for just nine points and six rebounds, but wreaked havoc on the defensive end, played hard in the paint, and made their presence felt in Banks' first real league test of the season. "Our younger girls each game are getting better and better," said Begley. "Maggie (Streblow) played a tremendous game and has really been stepping up." 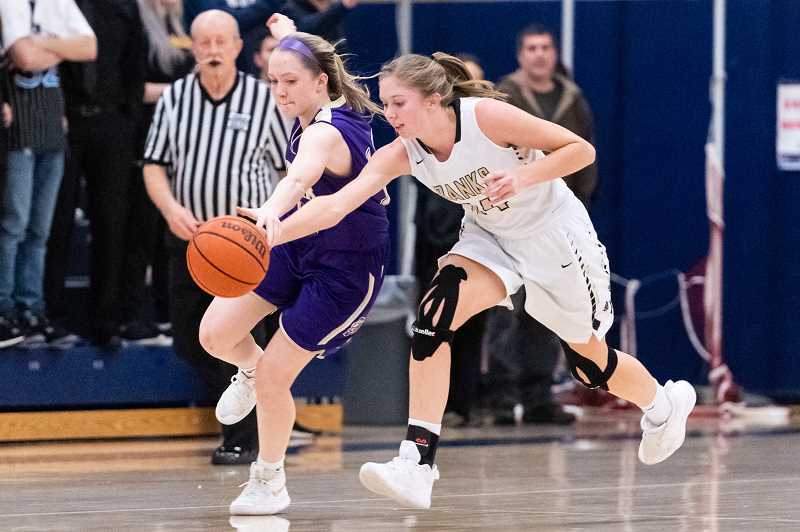 Despite their 13-4 record and number two OSAA ranking, the Braves were slow out of the gate this season and have been working mightily towards meshing their older, established talent, with a crop of youngsters relatively new to the varsity game. But Begley said it's been a work in progress and that he's starting to see the fruits of all their labor both on the practice court and in games. "We're starting to get there," he said. "I thought we played better as a team tonight which was good to see, and defensively we played well for most of the game. We still had some sloppy play and still some miscommunication on defense, but overall I'm happy with the girls' performance." Slifka led all scorers with 23 points while grabbing nine rebounds. Last year's 4A State Player of the Year made her presence felt from the opening tip, repeatedly getting her hands in the passing lanes, creating turnovers and ultimately lay-ins at the other end. In addition, her patience at the offensive end was impressive, in contrast to earlier in the year when the standout appeared to be pressing in an effort to make things happen. "Early in the season she was trying a bit too hard, thinking she had to shoulder too much of the load," Begley said. "The last few games she's played much more within herself and trusting her teammates more, and they've given her reason to trust them. When she's letting the game come to her, she's tough." It was Astoria though that looked ready to go early, jumping out to a quick 6-0 lead with consecutive baskets from Julia Norris, Hailey O'Brien, and Kelsey Fausett. But Banks' Nelson got the Braves on the board with a long three-pointer, Shook followed suit with one of her own, then back-to-back baskets by Slifka turned a six point Braves deficit into a 10-6 lead, and Banks never looked back from there. The Braves led 15-6 after a quarter, took a double-digit lead to the half, then built as much as a 21 point lead in the third quarter before cruising to a 19 point win. While just the second game of an eight game league schedule, Begley didn't pull any punches regarding the enormity of the win over an Astoria team that the coach believes is one of their biggest Cowapa competitors. "This was a big win for us," said the coach. "It was important to get them at home because they're tough on the road. They're going to be fighting for that league title, so I was glad to see us get that win." In addition to Slifka, Begley singled-out Nelson, who scored nine points and led the Braves with 12 rebounds, for stepping up her game for the night's early season battle with the Fishermen. He spoke to the senior's role as the team's inspirational leader and too spoke to her growing comfort with the young team around her. "That's the best I've seen Gracie play this season," Begley said. "She also was trying to do too much, but tonight played within herself, had fun and played with energy. That hustle play at the end was what we need from her, to be that spark, bring energy, and I was really happy to see her play well tonight." Astoria was led by Brooklynn Hankwitz who scored seven points, while O'Brien and Fausett each added six. Banks hosts Valley Catholic next Tuesday, Jan. 22, then has a week off before traveling to Seaside for a game with the Seagulls, Jan. 29.